Adenoma, Pleomorphic; Biopsy, Fine-Needle; Adenoma, Malignant. Parotid gland surgery can be challenging due to intricate relationship between the gland and facial nerve. Besides complete removal of the lesion, the main focus of surgery is centered on the facial nerve. Surgery can be technically demanding especially when the tumor is large or involves the deep lobe. We report a patient with a 30-year history of gigantic parotid mass, which initial fine-needle aspiration cytology reported as pleomorphic adenoma. The tumor, weighing 1.3 kg, was successfully resected with facial nerve preservation. Histopathological examination of the excised mass confirmed as carcinoma ex pleomorphic adenoma (CaExPA) of adenocarcinoma, not otherwise specified type. We describe the specific surgical and reconstruction techniques for successful removal of large parotid tumors with facial nerve preservation. To our knowledge, this is the heaviest CaExPA of the parotid gland in South-East Asian region. The parotid gland is the largest major salivary gland. Approximately 80% of tumors arising from this gland are benign,1 of which pleomorphic adenoma (PA) is the most common histology.1 The usual treatment option is superficial parotidectomy. A long-standing PA, over the period of many years, has a higher chance of malignant transformation. Facial nerve palsy at presentation regardless of the tumor size is highly suspicious of malignancy until proven otherwise.2 Complete removal of gigantic parotid tumor poses challenges due to distorted anatomy and reconstruction requirements. We report a case of an enormous parotid tumor, which clinically appeared benign with intact facial nerve, but the final histopathology result was adenocarcinoma, not otherwise specified carcinoma ex pleomorphic adenoma (CaExPA). 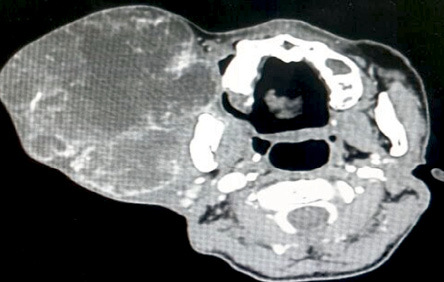 A 56-year-old man presented with a 30-year history of right neck swelling. It was painless and progressively increased in size with no history of facial nerve involvement. There were no obstructive symptoms such as, hoarseness, odynophagia, dysphagia, or constitutional symptoms. He denied any associated aural or nasal symptoms. Further history revealed that seven years prior, the mass was diagnosed as PA based on fine-needle aspiration cytology (FNAC). He was offered surgical excision but was not keen. However, in recent times, the mass had grown to such an extent it started to interfere with daily activity and cause embarrassment. This prompted him to seek medical attention. FNAC was performed on the mass, which confirmed it to be PA with marked nuclear atypia suspicious for malignant transformation. Upon examination, the patient appeared comfortable with no evidence of respiratory distress. There was an enormous multilobulated right parotid mass consisting of two prominent swellings, each measuring 15 × 10 cm and 15 × 20 cm extending from the right preauricular region to the supraclavicular region inferiorly [Figure 1]. The mass was firm, not fixed to overlying skin, non-tender, and non-pulsatile with no external skin changes. General examination was unremarkable with all intact cranial nerves. Computed tomography scan showed a multilobulated heterogeneous mass with peripheral enhancement [Figure 2]. The patient was counseled for right total parotidectomy. 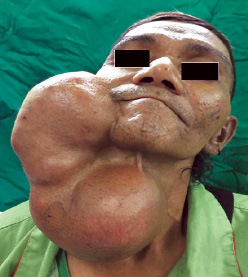 Figure 1: Gigantic right parotid swelling. Figure 2: Computed tomography scan of the neck demonstrating multilobulated right parotid mass. 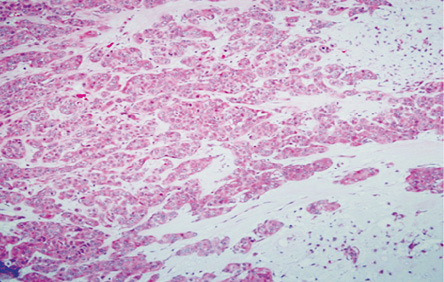 Figure 3: Area of malignant transformation (hematoxylin and eosin stain), carcinoma ex pleomorphic adenoma with the residual chondomyxoid stroma, magnification = 20 ×. 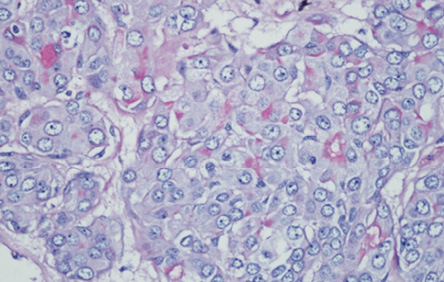 Figure 4: The cytoplasm of these malignant cells stain positively for mucicarmine, thereby highly indicating an adenocarcinoma, not otherwise specified. Right total parotidectomy with facial nerve preservation and primary closure was carried out successfully. We opted for an elliptical incision, centered diagonally across the parotid mass. This was to allow the removal of thinned-out skin together with the tumor and have a reduced and manageable skin flap. Both superior and inferior lips were elevated in a different direction towards the edge of the tumor. This would help to dissect and identify facial nerve trunk at the inferior edge and facial nerve branches at the superior edge. The facial nerve trunk was identified at the usual location. The tumor was from the deep lobe of the parotid gland. The facial nerve was dissected by strip-band style of dissection (with small strip of normal fascia underneath). The tumor was delivered in en-bloc with the intact capsule. A well-encapsulated, multilobulated parotid mass measuring 20.5 × 12 × 15 cm and weighing 1.3 kg was removed. The inner aspect of the mass was seen to be in contact with the buccal mucosa. Stensen’s duct was identified and ligated. Biopsies from resection patient margins were taken, which later turned out to be negative. The postoperative period was uneventful. The patient had House-Brackmann grade 2 temporary weakness on lower division of facial nerve. He was discharged from hospital after three days inpatient stay. The facial nerve was intact upon subsequent follow-up visit with no evidence of recurrence seen to date. The final pathology reported as CaExPA. Histopathology revealed an encapsulated and lobulated tumor with heterogenous cut surface of tan-color, soft-to-firm consistency with multiple hemorrhagic areas, and small cystic spaces. Microscopically, the tumor exhibited areas of PA characterized by a mixture of cellular epithelial, myoepithelial, and chondromyxoid stroma [Figure 3]. PA is the most common benign salivary gland tumor of the parotid gland,1 which manifests as a slow-growing, painless swelling that gradually increases in size. It commonly manifests between the third and fifth decade of life with a female predilection. Surgical excision with a good safety margin is agreed upon unanimously. Rarely, this type of tumor can metastasize and may remain a benign lesion histologically.1 Over the decades, unoperated PA may transform into CaExPA. Parotid tumors, benign or malignant, are treated primarily with surgery. The extent of the tumor, its aggressiveness, and its relation to the vital structures notably facial nerve involvement should be taken into consideration. Removing larger tumors needs specific considerations. In our case, incision had to be modified from the usual modified Blair incision. The surgical incision is crucial not only for safe and complete dissection but also for cosmetically satisfactory closure. The deep cervical fascia was mobilized and positioned to cover the defect. The maneuver aimed to reduce soft tissue defect and prevent the development of Frey’s syndrome. The redundant skin flap was excised for precise and cosmetically appealing closure. Lazy T type incision was fashioned to compensate for excess soft tissue and skin in the cervical region. The elliptical skin incision not only allows removal of the thinned-out, potentially tumor invaded skin, but also avoided the need for free tissue transfer. Postoperative radiation may increase the chance of survival when adequate margin clearance cannot be achieved,8 especially with the minimally invasive type (< 1.5 mm beyond the capsule). Perineural invasion has been reported to exhibit a higher risk of metastasis to the brain via the temporal bone.9 Recurrence rate has been documented to be higher in CaExPA with distant metastasis, even after surgical excision.10 Hence, limited neck dissection is one of the best options for the patient with clinically and radiologically negative nodes.11 Combined team management may favor a better outcome. Neck dissection versus radiotherapy or concurrent chemotherapy is among the options that should be analyzed. The 15-year survival rate for this type of salivary malignancy is 3%.11 Thus, prolonged follow-up is mandatory. CaExPA, albeit rare, warrants prompt management as this may prevent a devastating outcome like perineural invasion distant metastasis, which succumbs patients to poor prognosis. In our patient, early follow-up would have given a better prognosis to the patient. Usually, benign parotid tumors are often small and asymptomatic at initial presentation. In general, surgical interventions are not gladly entertained by the majority of patients after knowing the potential risk to the facial nerve. This case illustrates the fact that a parotid tumor has the propensity to enlarge into gigantic mass and the potential malignant transformation. This has to be emphasized to patients during early consultation. 1. Bailey BJ, Johnson JT. Bailey’s head and neck surgery-otolaryngology. 5th ed. In: Rosen CA, Johnson JT, editors. Wolters Kluwer Health/Lippincott Williams & Wilkins; 2014. p. 692-694. 2. Eneroth CM. Facial nerve paralysis. A criterion of malignancy in parotid tumors. Arch Otolaryngol 1972 Apr;95(4):300-304. 3. Priyanka KP, Divya U, Majumdar S, Sridhar RV. Carcinoma ex Pleomorphic Adenoma histopathology the gold standard. Austin Clin Microbiol 2016;1(1):1005. 4. Zarbo RJ. Salivary gland neoplasia: a review for the practicing pathologist. Mod Pathol 2002 Mar;15(3):298-323. 5. Ellis GL, Auclair PL, editors. Tumors of the salivary glands. AFIP atlas of tumor pathology, 4th series, fascicle 9. Silver Spring: ARP Press; 2008. p. 123-133. 6. McHugh JB, Visscher DW, Barnes EL. Update on selected salivary gland neoplasms. Arch Pathol Lab Med 2009 Nov;133(11):1763-1774. 7. Deng R, Tang E, Yang X, Huang X, Hu Q. Salivary adenocarcinoma, not otherwise specified: a clinicopathological study of 28 cases. Oral Surg Oral Med Oral Pathol Oral Radiol 2012 May;113(5):655-660. 8. Hosokawa Y, Shirato H, Kagei K, Hashimoto S, Nishioka T, Tei K, et al. Role of radiotherapy for mucoepidermoid carcinoma of salivary gland. Oral Oncol 1999 Jan;35(1):105-111. 9. van der Laan BF, Baris G, Gregor RT, Hilgers FJ, Balm AJ. Radiation-induced tumours of the head and neck. J Laryngol Otol 1995 Apr;109(4):346-349. 10. Borthne A, Kjellevold K, Kaalhus O, Vermund H. Salivary gland malignant neoplasms: treatment and prognosis. Int J Radiat Oncol Biol Phys 1986 May;12(5):747-754. 11. Barnes L, Eveson JW, Reichart P, Sidransky D. World Health Organization classification of tumours. Pathology and genetics of head and neck tumours. Lyon: IARC Press; 2005.